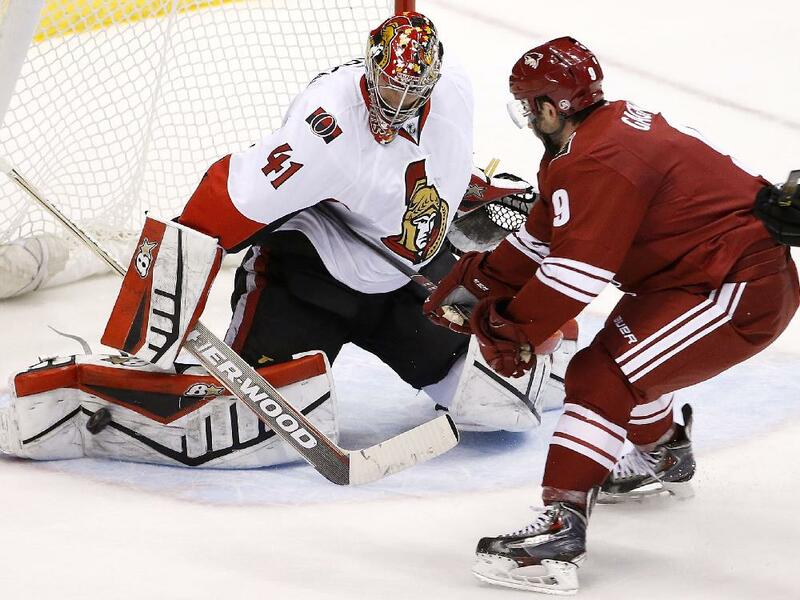 GLENDALE, Ariz. — The Ottawa Senators hadn’t scored a power-play goal since before Christmas. But there were all kinds of presents sitting around the Arizona Coyotes net Saturday, and the Senators collected each one to end a three-game losing streak. Rookie Mike Hoffman scored his 14th goal, and Clarke MacArthur and Cody Ceci scored power-play goals to help the Senators to a 5-1 win at Gila River Arena. Hoffman, who earlier Saturday was named to the 2015 Honda NHL All-Star Skills Competition, has scored four goals in the past seven games to tie Filip Forsberg of the Nashville Predators for the rookie goal lead. Milan Michalek and David Legwand scored for Ottawa (17-16-8), and Mika Zibanejad had two assists. Goalie Craig Anderson made 31 saves for the Senators, who won for the third time in the past nine games (3-4-2). The Senators were 0-for-28 on the power play over the past eight games, dating to Dec. 18. Arizona (16-21-4) has allowed at least five goals 12 times in its 41 games and has been outscored 17-1 in its past three losses. The Coyotes have allowed 136 goals this season, third-worst in the NHL behind the Buffalo Sabres and Edmonton Oilers. Mikkel Boedker gave the Coyotes a 1-0 lead 4:31 into the game. Boedker scored on each of his shots in a 4-1 win against the Winnipeg Jets on Thursday, but the Coyotes didn’t show any of the jump they had in that one. The Coyotes, who scored six power-play goals in the past three games, were 0-for-5, 0-for-3 in the second period. Mike Smith made 28 saves. Boedker took a Sam Gagner pass in the circle, curled toward the slot and patiently picked out the top corner over Anderson for his 12th goal of the season. The second assist went to rookie Lucas Lessio, his first NHL point in his eighth game. Martin Erat took a holding penalty and the Senators scored as the power play was ending. Erik Karlsson hit the post with a slap shot and the rebound set off a scramble in front of the crease. Zibanejad pushed the puck to Michalek at the side of the net, and he scored his fourth goal at 7:08 to tie it 1-1. The Senators took a 2-1 lead at 13:09 on a nice play by Kyle Turris. He sped around the net and tried a wraparound that was stopped by Smith. The loose puck slid between the skates of Arizona defenseman Chris Summers to MacArthur, who scored his 12th of the season. Ottawa extended the lead in the second period, seconds after a shot by Arizona’s Brandon Gormley hit the crossbar behind Anderson, went along the goal line but didn’t cross. Hoffman stole a Keith Yandle pass in the Arizona zone, took a return pass from Zibanejad and beat Smith at 9:31 to give the Senators a 3-1 lead. Ceci made it 4-1 on a power play 1:26 into the third period on a setup from Karlsson. Legwand scored with 6.5 seconds left.